One afternoon, the then CEO and Chairman of Shell UK, Chris Faye, walked into our office and sat on one of the desks. Well, this just didn’t normally happen. He was Shell royalty. And we were, well, we were not. It was about twenty years ago. I was in my early twenties, working for Shell, doing my thing to help keep the mighty cogs moving. I worked in a team of five, fairly low down on the pay scale, working in a building with thousands of others. Chris introduced himself, asked us questions about what we did, really listened to what we said and thanked us for all our efforts. He talked about the state of the market and told us about things he was planning on doing with the business. He sat, chatted and laughed with us for about 20 minutes. And then he left and we all looked at each other and wondered if that had really just happened. The effort on his part? Minimal. Impact on us? HUGE. Was that twenty minutes solely responsible for making me a more engaged employee (if that term even existed then)? Probably not on its own. Did it give me a massive boost and make me feel like I was working in a really great company? Absolutely. Some little things you do can make a massive difference. 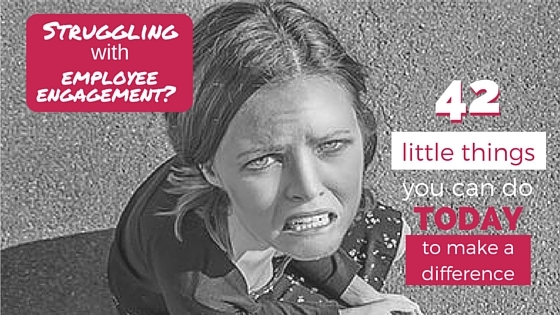 They may not solve the employee engagement conundrum by themselves. However, they will make it a better place to work while you figure out the big stuff. And that has got to be a good start. Employee Engagement: Just start simple. You can get fancy later. Make a point of recognising one employee who is putting in extra effort publicly today. Send an email to thank someone and copy in your manager. Assigning a task? Tell them why you need them to do it to give them some context. Is it a particularly tough time at the moment? Buy cookies, or lunch, or beer. Get your team away from their desks for 15 minutes and give them an update on how the company is doing. (Use language that means something to them – the term EBITA should never be used in a wide audience). Tell them how what they are doing makes a difference to the business. Treat her to a night out with her partner, or a day out with her kids. Remember long hours are tough for the family too. Let him go to Toby’s school football game or see Daisy star as Mary in her nativity play. He will pay you back in bucket loads. Ask for his ideas to improve his job, listen and ask him to run with them. Trying to empower a team member to make more decisions? Support him even if you don’t agree with every one he makes. If it is critical that a decision that he has made needs to be changed, let him find a way to do that without him losing face. Laugh with your team today. Are the team in the middle of a crisis? Let them run with it but let them know you are ready to support however they need you. If nothing else, make the tea. Don’t assume they know everything that is going on. They probably don’t. Clarify one thing that may be causing confusion today. Schedule one to one’s with each of your team over the next week or so. Feedback – good and bad – is for every day not just for annual reviews. Recognise an area where one of your team could benefit from some coaching – spend some time with them today. Every role has a customer. Get your team members to spend time with theirs to see the impact their role has. Ask your team about one thing that slows them down at work and get ideas from them on how to fix it. Review the development plan of one of your team. What one thing can you do today to help them move towards their goals? Encourage your team to create a 30 or 90 day plan and share them with their peers so everyone understands each other’s priorities. Share some great feedback from a customer or beneficiary of your service. Are things changing? Take 10 minutes to give them an update ‘Here’s what’s happening and here’s what to expect’. Find out if they are happy. No, don’t create a survey. Go sit with them and listen. Just signed off a project and not everyone got thanked? Publicly give credit where credit is due. Show you are human, admit to a mistake. Don’t just talk to your direct team, talk to their team members too. Go sit with one and find out how they are doing. Learn more people’s names. It feels great when someone greets you by name when you thought they didn’t know who you were. If someone wants to talk to you, find time for them no matter what level they are at. Find out something new today about your employee’s life outside of work. Check in with your team that they have the resources they need to be at their best. Help them move an obstacle in their way. What is wasting people’s time – pointless meetings, emails that copy the world, laborious expense systems? Ask your team what the worst ‘time waster’ is and plan how to change it. Have you told your team lately what your expectations are of them? And asked them what they expect of you? Work out ways you can put more boundaries between home and work to give them a better balance. In everything you do, make it clear that you have their back. Check on their workload. Do they have too much to do to do any of it well? Multitasking is a fool’s game. Someone doing a great job? Go over and thank them. These are low cost, low tech actions you can make today. Even if you just pick one or two things, they will notice. But be consistent. You should make a point to do something every day. Any of these look like lip service if they are only done once. And I know you are busy, that you have a lot of work on. But if you start losing your team members, your workload is only going to get worse. This is the stuff that really matters. Besides, I expect the Shell UK CEO had a pretty busy schedule too. Think back. Has there been a small thing that a manager has done for you that made a positive impact to how you felt? I’d love to hear about it in the comments.